Flyaway Charters run similar boats out of Coral Bay and are available for tandem charters. 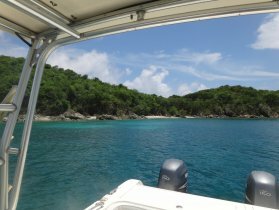 Jason S’ company, Island Roots, has a 32' World Cat and can accommodate groups up to 12 out of Cruz Bay. Jen will take you kayaking, paddleboarding, snorkeling or for a hike. Book a tour or visit the beach hut across the road from Maho. 1928 John Alden design, 65′ overall, hand built by owners, Twig and Bonnie, at their shop in Maine. Heron sails throughout the Caribbean and Maine. Born to Rhumb can accommodate up to 15 passengers (12 international) and is our go to suggestion for people with more than six in their group. Fair Winds and Following Seas; We manage this beautiful short term rental here in Coral Bay. Miles of panoramic views, tropical gardens, private decks, and hot tubs. Accommodations for two to four guests. Calabash Cottages; Four Coral Bay properties (and one in Belize) managed by Susan. Great views, hot tubs, and top of the line customer service. Little Lagoon; Ernest, an Olympian and firefighter, and his wife Donna have a beautiful apartment for rent in John’s Folly, right on the water with plenty of water sports equipment; Hobie cat, kayaks, snorkel gear, etc. Villa Equinox; Villa in Fish Bay owned by local builder, Nelson. Star Villas; Located in the Frank Bay area of Cruz Bay, Bob and Marlene have several places to choose from. Villa Andara; Beautiful 2BR house out on the East End overlooking North Haulover Bay. Reef Madness; Great villa on top of Coral Bay’s Seagrape hill. East of Eden; A beautiful villa on the East End of St John. Stairs to the beach to swim or kayak. Joy of Life Villa; Perched high atop a hill these two villas offer stunning views of the East End of St Thomas and the British Virgin Islands. Still looking? St John-Villa Rentals connects you directly to owners and property managers of houses on St. John. Avoid the Homeaway and VRBO fees!